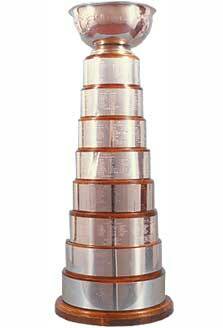 The Joseph Turner Memorial Cup was awarded annually by the Board of Governors of the International Hockey League (IHL) to the team winning the playoff championship. The award was named after Joe Turner, a young Windsor, Ontario athlete who drew distinction as a quality amateur goalie in the Michigan-Ontario league. He turned professional with the Detroit Red Wings of the National Hockey League and played with Detroit's American Hockey League farm club in Indianapolis. He led the Capitols to the 1940-41 Calder Cup championship as the league's First Team All-Star goaltender. Joe Turner was killed in action on December 13, 1944 during World War II as a member of the United States Army.